Meriwether Lewis, left, and William Clark. 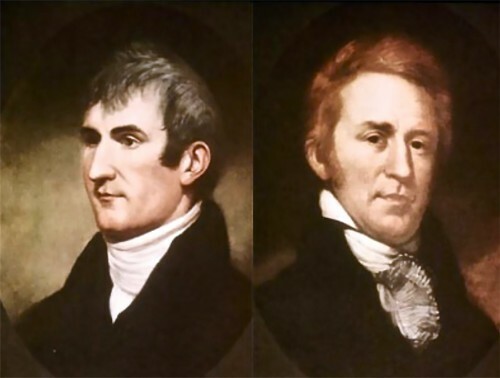 Meriwether Lewis and William Clark were American explorers who led the Lewis and Clark Expedition through the uncharted American interior to the Pacific Northwest in 1804–06. Known as the “Corps of Discovery,” the Lewis and Clark Expedition spanned 8,000 miles and three years, travelling down the Ohio River, up the Missouri River, across the Continental Divide, and ultimately to the Pacific Ocean. Lewis served as the field scientist, chronicling botanical, zoological, meteorological, geographic and ethnographic information. Upon their return to Washington DC, Lewis was given his salary and 1,600 acres of land. He was later named governor of the Upper Louisiana Territory. Learn more about Lewis and Clark.